In this final and most ambitious book in a wonderfully inventive sci-fi trilogy, veteran interplanetary travelers Jamie and Ramsay must protect their alien friend Wishaway, now living with them on Earth, from the scrutiny of sinister forces on their own planet. In the meantime, Wishaway’s beloved home planet of Altair seems to be hurtling toward doom. 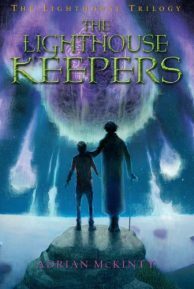 Just when circumstances on both worlds are at their most dire, members of the ancient race who built the mysterious lighthouses return to offer Jamie a terrible choice: He can save Earth or Altair, but not both. The fate of two planets is in the hands of the teenage Lord Ui Neill. Which home will he save? His or Wishaway’s? The worlds that Adrian McKinty’s characters inhabit are vividly real. This third book will be the sleeper hit of the fall season.